The Fieseler Fi 156 Storch (English: Stork) was a small German liaison aircraft, army co-operation (today called forward air control), and medical evacuation aircraft built by Fieseler before and during World War II. It remains famous for its excellent STOL performance. A design feature rare for land-based aircraft enabled the wings on the Storch to be folded back along the fuselage in a manner similar to the wings of the US Navy's Grumman F4F Wildcat fighter. This allowed the aircraft to be carried on a trailer or even towed slowly behind a vehicle. The primary hinge for the folding wing was located in the wing root, where the rear wing spar met the cabin. The long legs of the main landing gear contained oil-and-spring shock absorbers that had a travel of 40 cm (15-3/4 inches), allowing the aircraft to land on comparatively rough and uneven surfaces - this was combined with a "pre-travel" distance of 20 cm, before the oleos began damping the landing gear shock. 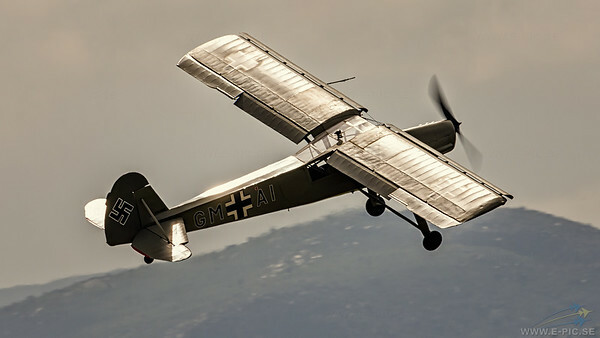 In flight, the main landing gear legs hung down, giving the aircraft the appearance of a long-legged, big-winged bird, hence its nickname, Storch. With its very low landing speed the Storch often appeared to land vertically, or even backwards, in strong winds from directly ahead. The Storch was deployed in all European and North African theaters of World War II, but it is probably most famous for its role in Operation Eiche, the 1943 rescue of deposed Italian dictator Benito Mussolini from a boulder-strewn mountain-top near the Gran Sasso. Even though the mountain was surrounded by Italian troops, German commando Otto Skorzeny and 90 paratroopers used gliders to land on the peak and quickly captured it. But the problem of how to get back off remained. A Focke-Achgelis Fa 223 helicopter was sent, but it broke down en route. Instead, pilot Heinrich Gerlach flew in a Storch. It landed in 30 m (100 ft), and after Mussolini and Skorzeny boarded, it took off in 80 m (250 ft), even though the aircraft was overloaded. On 26 April 1945, a Storch was one of the last aircraft to land on the improvised airstrip in the Tiergarten near the Brandenburg Gate during the Battle of Berlin and the death throes of the Third Reich. It was flown by the test pilot Hanna Reitsch, who flew Generalfeldmarschall Robert Ritter von Greim from Munich to Berlin to answer a summons from Hitler. Field Marshal Rommel used Storch aircraft for transport and battlefield surveillance during the North African desert campaign of World War II. During the war a number of Storches were captured by the Allies. One became the personal aircraft of Field Marshal Montgomery. Others were used as the personal aircraft of Air Vice Marshal Arthur Coningham and Air Vice Marshal Harry Broadhurst, who acquired his Storch in North Africa, and flew it subsequently in Italy and North-West Europe.